Featuring an unmatched combination of warmth, lightweight packability and protection that’s crucial for alpine pursuits like climbing, skiing and trekking, the Hyperia Lite Jacket offers technical performance with natural merino insulation. The Hyperia’s ultralight yet durable Pertex® Quantum Air shell features a DWR finish that sheds variable conditions. Inside Icebreaker used their innovative MerinoLOFT™ insulation, a sustainable and high-lofting alternative to synthetic fills made from all-natural merino wool (up to 10% of which is recycled). MerinoLOFT retains warmth when wet and naturally helps regulate body temperature to keep you comfortable everywhere from local rock climbs to backcountry hut trips. Zippered hand pockets and an internal zip pocket store small essentials, offset shoulder seams eliminate chafing when you’re moving with a pack and the jacket stows in its internal pocket for premium packability. Hyperia Lite Jacket - Mens is rated 4.9 out of 5 by 13. Rated 5 out of 5 by ColinSharpe from So light and warm Haven't used it in the field yet, but nonetheless, it's super light and comfortable. Feels really warm as well, especially given it's weight. Love the feel of it and the fact that it folds up into its own pocket. Also happy with the fit. Tough to find clothing that fits me well (6'3" and slim); I went with a medium, as it felt basically the same length as the large, but didn't have the extra girth that I don't need. I marked it as "true to size" because it seems that with Icebreaker I'm a Medium, whereas normally I purchase a Large with other brands; so if you're used to Icebreaker sizing, then it should fit the way your other gear fits. Very excited to use it this fall and winter. Rated 5 out of 5 by Davidinthemountains from Great fit and very versatile Living in the mountains versatility is very important to me. 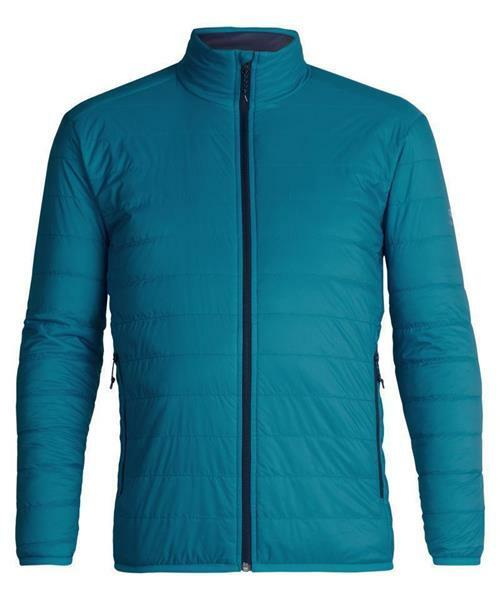 This jacket is great as a layering piece but is surprisingly warm on its own for how light weight and packable it is. The fit makes it a great technical garment but also looks good. Rated 5 out of 5 by bjmclennan from Great Jacket This jacket is a terrific lightweight ,but warm jacket. I use it on its own in the fall, but will use it as a undelayer for skiing. Very packable with its own internal pouch. Rated 5 out of 5 by roxyreba35 from Perfect for everything I received this jacket as a gift from my parents. It's great for wearing anytime outdoors. Fits great. Highly recommend it. Rated 5 out of 5 by Thatman from This jacket will do it all Bought recently a hyperia lit and hyperia. I am in love with those 2. Amazing feel like every icebreaker product i own, very well built. The lite version will be a great piece for those cool days as a midlayer. Great moisture wickimg and breathability. Like all icebreaker products, AMAZING. Rated 4 out of 5 by KevyBoy from Fall/spring comfort Lightweight and breathable. Perfect spring/fall jacket. Tight fit if you’ll be layering so maybe go a size larger. Rated 5 out of 5 by DavidinEdm from Comfortable and smart Well made and tailored, true to size, light but warm, and easy to layer under. Will be my go-to spring jacket. Rated 5 out of 5 by biggie from Love! This is the perfect Vancouver jacket. Light, compact and super warm. Will also be a staple for travel.